In 2016 alone 14,978 cyclists were injured in Great Britain according to The Royal Society for the Prevention of Accidents. We at Barlow Robbins unfortunately see on a regular basis just how at risk a cyclist is on the road. Cyclists are one of the most vulnerable road users, in particular, in built up or slow moving traffic. The Highway Code is being revised to highlight the dangers to cyclists of close passing traffic. In particular, encouraging the use of the “Dutch reach”. What is the 'Dutch Reach'? 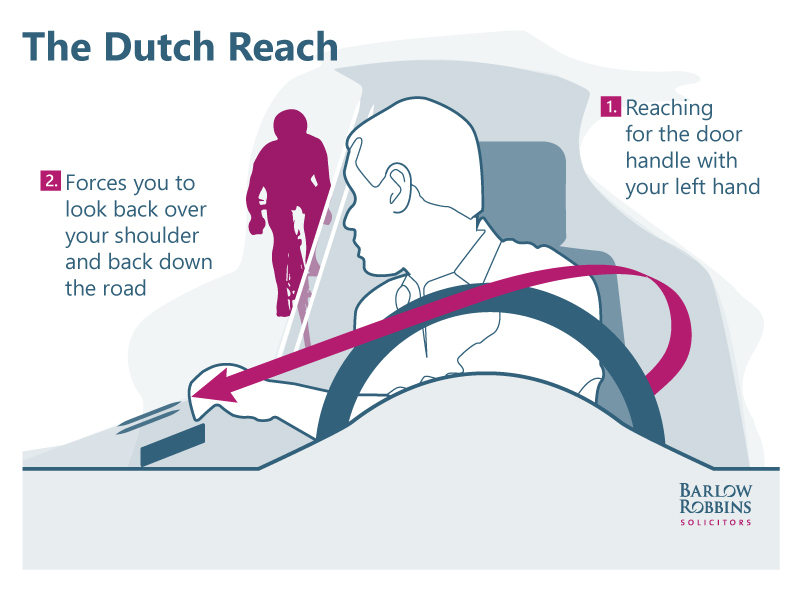 The “Dutch reach” is a move devised, whereby when drivers or passengers are reaching for the car door to exit a vehicle, instead of using the hand closest to the handle, people instead are encouraged to use the arm furthest away from the door. This action pulls the torso round so that passengers and drivers are forced to look back over their shoulder and back down the road. This means that they are checking behind them for approaching traffic, especially cyclists. The offence of “dooring”, where a cyclist is injured as a result of being hit by a car door is an offence under Section 42 Road Traffic Act 1988. Specifically, it is an offence to open “any door of a vehicle on a road so as to injure or endanger any person”. It is important to note that this is not limited to drivers but passengers too, and offenders are subject to a fine up to £1,000. However, campaigners are already calling for this to be reviewed and harsher penalties but in place. This simple movement, changing the hand that you use to open the door of a car whilst exiting has the potential to significantly reduce the number of injuries to cyclists on the road. If you consider this situation applies to you, our specialist team of solicitors can help you recover the compensation you deserve. Please contact 01483 543200 and ask to speak to one of the Personal Injury team and they will happily speak to you further about this.